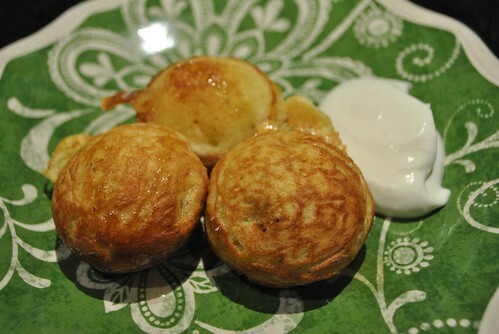 My history with Ebelskivers spans about two years. I first heard about them from a friend while we were on one of our early Sunday runs. Intrigued, they were automatically stored in the front of my mind. For easy access of course. A few months later, I was having breakfast with a friend at Shopsins when the word Ebelskivers magically caught my eye (if you’ve seen their menu, you will understand that unless you are looking for it, you aren’t going to find it). So, after a meal of mac and cheese pancakes (Yes, it sounds odd, but they were delicious), we topped it off with an order of Ebelskivers. It was as good as I had imagined. 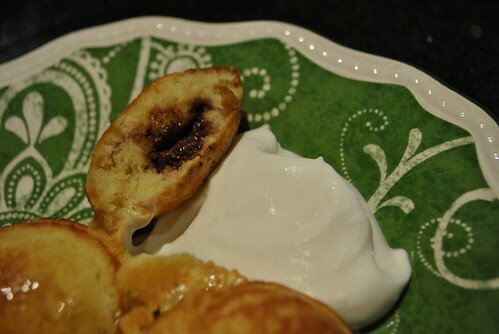 Fluffy light pancake balls with banana on the inside and chocolate on the outside. Very similar to the Chinese Egg cakes, but much bigger, and with stuff on the inside and chocolate. And now it brings us to today. 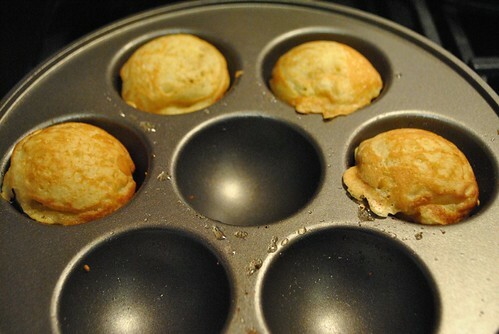 Today I broke out my Ebelskiver pan and took it for a spin (I’ve had it for over a year now…it was a gift…I still owe her a batch…:-)). 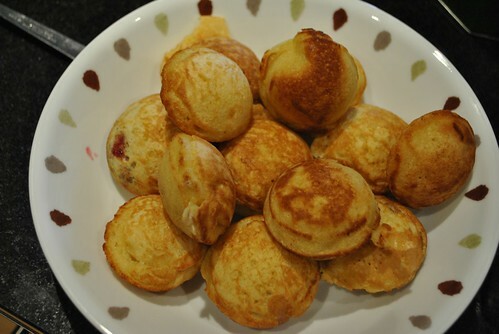 I also had an Ebelskiver mix I bought from the same place the pan came from (not a year old, this was purchased recently). Now all I needed were two eggs, 2 tablespoons melted butter and 1 cup of milk. I weighed out 190g of the mix and put it in a large bowl. 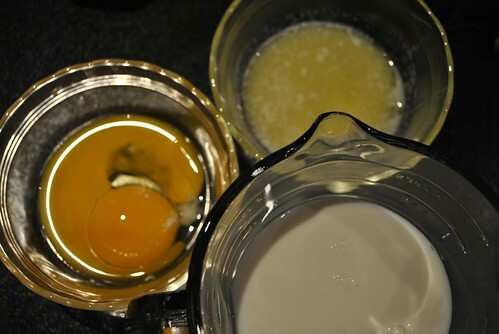 Then I separated the two eggs sloppily, and put the egg yolks and melted butter into the milk and whisked until it was all combined. Into the bowl with the mix, it went and I gave it a good stirring until it was just coming together smoothly. Out came my trusty stand mixer with the whisk attachment. In went the egg whites. On went the mixer (med-high) and whisked until stiff peaks start forming. I folded the egg whites into the mix in two additions. 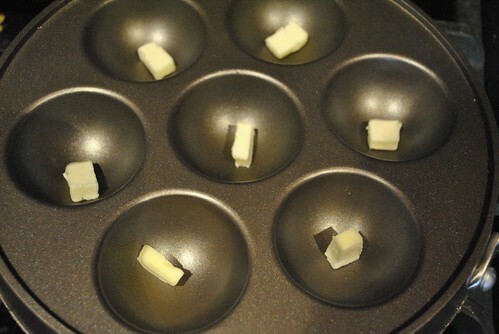 I put a tiny cube of butter in each well, and put it over medium heat until the butter was melted. A tablespoon of the batter into each well was followed with a small scoop of filling plopped into the center of the batter in the wells. 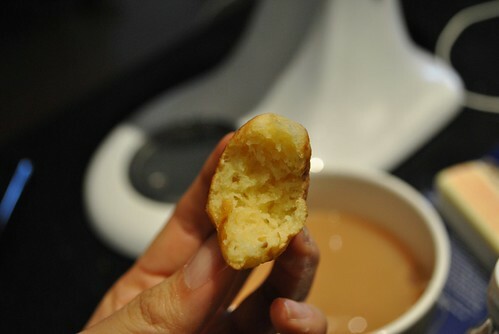 I covered the filling with another tablespoon of the batter. Once the edges start looking like it’s separating from the edges of the well, take two skewers or two chopsticks or the turning tool you can get (but don’t really need) and gently turn the ball over. It will feel messy and don’t worry if your turning instrument ends up in the middle of the ball. It will settle on its own. Once the other side is golden brown, they are done and ready for eating! I served mine with some softly whipped cream (which takes no time at all to whip by hand). In my first batch, I filled mine with Nutella. My second batch had Lingon Berry Preserves and my third were plain. The Nutella were by far my favorite. 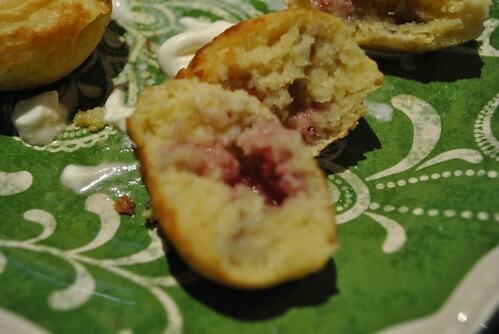 The Lingon berry preserve kind of absorbed into the pancake itself, and they felt more gooey. The plains were pretty good and went well with maple syrup. Overall, I think it’s a nice weekend breakfast treat or even breakfast dessert. Even for a mix, it takes a little more effort than pancakes from a mix, but it’s well worth it. You can fill them with anything some what solid, and won’t melt when heated. Even pieces of fruit! Once this mix is gone, I will have to give it a try from scratch. I didn’t realize the tag on the pan had a recipe from scratch. Next time…but first, I need to pick up some more Nutella!